eligibility conditions can apply for these Assistant Engineer (Civil) Jobs through online using Gujarat GPSC official website https://ojas.gujarat.gov.in from 15/09/2017 till 03/10/2017. Total GPSC Recruitment vacancies are 73 posts out of 24 vacancies are reserved for Woman candidates. Please visit GPSC notification for category wise vacancies. Candidates with AMIE/B. Tech/B.E. in Civil Engineering discipline qualification and with the age below 35 years are eligible for GPSC Assistant Civil Engineer Jobs. GPSC Recruitment of Assistant Engineer (Civil) jobs selection is based on Prelims Exam and followed by interview. The tentative date prelims exam and Interview are given briefly in the notification. Detailed description of Gujarat Public Service Commission GPSC Assistant Civil Engineer Jobs Recruitment are given below. 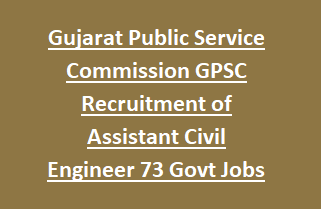 The total 73 Assistant Engineer (Civil) vacancies available in GPSC Recruitment. Post Name: Assistant Engineer (Civil): 73 posts. GPSC Assistant Civil Engineer jobs Recruitment Selection is based on Preliminary Examination and interview. Candidates who have cleared the Preliminary exam successfully will be called for interview. Final results date: During 10 working days after the date of Interview. Prelim’s exam will be conducted for 300 marks. Part 1: will conducts for total 100 marks, Covers General Studies, General Knowledge, General Mental Ability, History & Indian Economy. Part 2 will be conducted for 200 Marks, covers the topics of B. E Civil Engineering. Scale of Pay for GPSC AE (Civil) jobs is Rs. 44,900/- to Rs. 142,400/- per month. Candidate's upper age limit is 35 years as on 02-August-2017. For SEBC/ SC/ ST/Women candidates age will be relaxed by 05 years. For Reserved women candidates age will be relaxed by 10 years. Qualifications for Assistant Engineer AE (Civil) jobs is AMIE/B. Tech/B.E. in Civil Engineering discipline from any State or Central govt recognized University. Eligible candidates have to apply online for GPSC AE (Civil) jobs using the official website of https://ojas.gujarat.gov.in. Applications submission through online starts from 15-09-2017 and closing date is 03-10-2017. Application submission is only through online. Complete the necessary details and upload with photo & signature before closing date. Application fee of Rs. 100/- plus postal service charges paid through online banking/ Credit card/ Debit card/ computerized Post Office/ DD. Closing date for submission of online applications: 03-10-2017. Tentative date for Prelims Exam Result: March -2018.